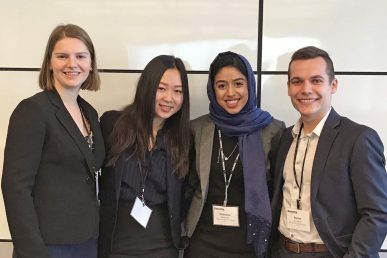 A team of students from the University of Illinois at Chicago College of Business Administration claimed second place at the Deloitte FanTAXtic national case study competition by working to solve a complex business case simulation. The competition was held Jan. 18-20 at Deloitte University near Dallas, Texas. Giselle Downs, junior accounting major; Downers Grove, Ill.
Maggie Mei, junior information and decision sciences major; Darien, Ill.
Nabeeha Bakhrani, sophomore information and decision sciences major; Plainfield, Ill.
Michal Kornecki, sophomore accounting major; Naperville, Ill.
Each member of the UIC team received a $1,000 scholarship. UIC will receive $5,000 for the scholarship fund. This year was the first time UIC was invited to compete in the Chicago regional competition, which included teams from the University of Iowa, Michigan State University, University of Illinois, Northern Illinois University and DePaul University. A total of 72 universities competed this year in the nine regional competitions. Each of the nine teams participating in the national competition won the Deloitte FanTAXtic contest in their respective U.S. regions. Sponsored by Deloitte Tax LLP and supported by the Deloitte Foundation, Deloitte FanTAXtic is designed to educate and prepare the next generation of tax talent for a career in business and tax services. At UIC Business, we transform student potential into success and connect students to Chicago’s living classroom. UIC is rated among the top 10 ‘Best Value’ universities according to the Wall Street Journal and Times Higher Education. UIC Business utilizes world-renowned research faculty and 35,000-strong alumni network to provide a proven business education to more than 3,200 undergraduates and 900 graduate students. UIC Business faculty empower students with real-world skills and professional experiences that add up to a high-value return on investment. Find out more at business.uic.edu.